Cobb salads are notoriously loaded. What could be more natural than loading up a pizza with those same delicious ingredients? Sounds natural to me! Preheat oven to 500°. While the oven is heating shape your dough into the desired shape, adding as little flour as possible. Poke several small holes in the crust with a fork to prevent bubbling. Transfer pizza dough to whatever, pan, stone, etc you will be using for cooking. Brush crust with a bit of extra-virgin olive oil, and cook without toppings for about 5 minutes. Add spinach, then half of the blue cheese and mozzarella. 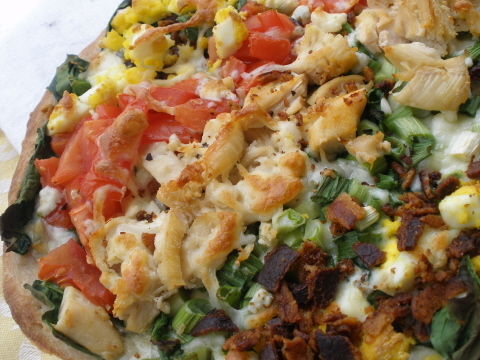 Follow by adding the following in any fashion you desire: egg, green onion, tomato, and chicken. Cook for 10 minutes, or until crust is golden brown. Remove from oven and sprinkle cooked bacon over desired area.